The Huawei P30 pro is a serious candidate for the Smartphone of the Year. But it has to compete with the best that the Apple world has to offer, and that's the iPhone XS. In comparison, the two have a lot in common, but also clear differences. Looking at the Huawei P30 pro and the iPhone XS, it quickly becomes clear that both are very high-quality and elegant smartphones. The P30 Pro is perhaps a bit more elegant with its more curved edges, but the iPhone XS can also be seen everywhere. The P30 Pro's display is much bigger, and if you're looking for more here at Apple, you can grab the iPhone XS Max - that's on a par with the screen diagonal. 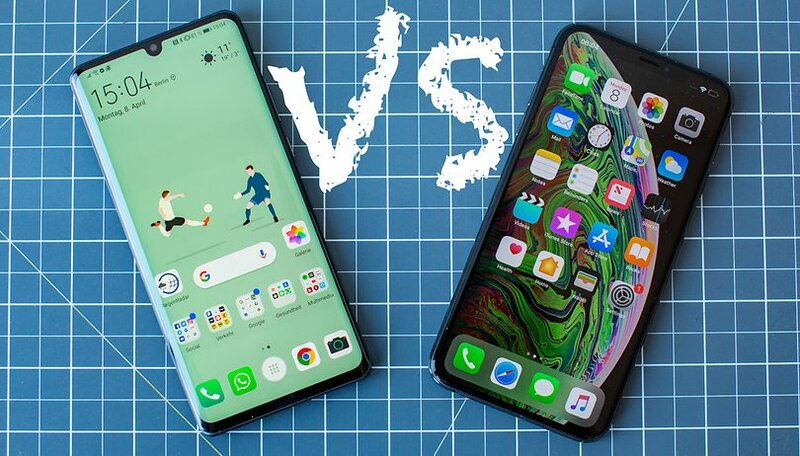 In terms of performance, both don't give themselves too much, and that's a good thing, because the Huawei P30 Pro and the Apple iPhone XS don't come out of the puff too quickly. But there are smartphones that are faster than the two, such as the OnePlus 6T. As far as biometrics is concerned, Apple and Huawei have different approaches: iPhone XS only comes with Face Unlock, 3D face recognition, while the P30 Pro puts a fingerprint sensor under the display, but scans the face only in 2D - a classic draw. One point where the iPhone XS has more to offer than the Huawei P30 Pro is memory. If you don't need much, you can go for the 64 GB version, and up to 512 GB. The P30 Pro has a maximum of 256 GB on board. They can be extended, but only with a NM-Card, Huawei's own memory card format. Even though our camera comparison between the P30 Pro and the iPhone XS is still pending, one thing is certain: the camera of the Huawei smartphone is one step ahead in creative possibilities with its enormous focal length bandwidth. With the iPhone XS, Apple won't be able to counter the impressive performance of low-light photography. Meanwhile, if you prefer filming instead of taking pictures, the iPhone XS should be better than the Huawei P30 Pro, because it can't quite keep up with the video performance. Meanwhile, iPhone XS has advantages especially in the area of software, at least for users who are generally on the move in the Apple cosmos. The close integration with Mac, Apple TV, iPad and all associated services is exemplary and miles away from the chaos that exists in some respects with Android and Windows. iOS may not seem very modern any more, and it's not as fast as some Android variants, but the system works flawlessly in many respects. One of the most frequent criticisms of the Huawei P30 Pro plays into this point. There are numerous duplicate apps waiting for the user, who often doesn't need them, but can't uninstall them either. Huawei needs to pre-install Google services, but also wants to place its own software, which is causing a lot of confusion, especially among newcomers to the field. The iPhone XS does not have this problem. The Huawei P30 Pro has a clear lead on the battery in two respects. Not only does the Huawei smartphone last much longer with one battery charge than the iPhone XS, it also fills up much faster with the included charger. Apple charges a hefty surcharge for the fast-charging power supply. After all, both can charge wirelessly. 9 - Pie Sorry, not yet available! Emotion UI Sorry, not yet available! microSD Sorry, not yet available! 2.6 GHz Sorry, not yet available! A comparison between top smartphones is not easy, because of course both are great devices. Anyone who is at home in the Apple universe and wants to stay there will certainly be happy with the iPhone XS. The advantages of the camera and the battery, which the P30 pro can book for itself, make the difference for me, because Huawei Apple is superior here. Slight advantage for Huawei and the P30 Pro. Choose “P30 Pro” or “iPhone XS”.